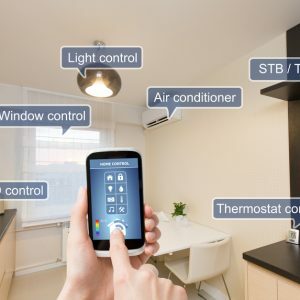 Connected devices hooked up to the Internet are advancing home automation in a way that helps you make your new home a clean, energy efficient and welcoming place. The key to controlling the devices can be a smartphone, tablet or computer. As you bring devices under your control and make your home a Smart Home, get them to interact with one another, you can also help them work together to improve your living environment even more. Voice automation, which involves controlling connected devices with your voice, makes it possible for you to direct many changes. Through a virtual assistant, the devices may be able to talk back, telling you everything from the weather outside to how you can order spare parts over the Internet if the device breaks. The best way to get an idea of what items can be connected is to take a tour of a residence with home automation. This will allow you to understand how the devices communicate with your phone and one another and what the items can do for you. The key areas of home automation are lighting, energy management, safety and security, electronics and entertainment, and locks, from garage doors to front doors. There are also automation options for gardens, decks, storage areas, and items for pets. The more innovative items on the market include solar panels to power a home, combined with occupancy sensors to make sure a person is in the home, and one-touch capability to lock the doors; and the assignment of unique codes to open the door, with alerts to your smartphone to tell you who is home and when they arrived. There’s even an internal camera for an oven that takes a picture of the meat or pie you’re cooking to help you decide when it’s done. It’s important to get some assistance to ensure connected devices are set up properly and are secure. One-third of homeowners who bought a house in 2015 are considering adding home automation systems to their residence. Creating an automated home is a process, especially if you’re adding devices over time. You should start with a professional and contact him or her for further assistance as needed. The first step of creating a smart home is installing a hub. This gadget connects all the devices. Hubs are not yet programmable to the point where the device will take certain actions when you express a concern. For example, if you say, “It’s cold in here,” the device may not know whether you want to turn on the heat and to what degree. Yet at this point, a hub should be able to schedule devices like thermostats and fans to turn on at a certain time. It may also be able to take actions such as shutting the lights and heat off when you leave the house. Working with a professional, especially on significant devices like thermostats and security systems, helps you get a sense of how you can talk to the hub and connected devices. It also shows you what innovations may be coming and how to bring them under the hub’s control. If you’re interested in a smart home that will make it easier for you to relax and save money, think of talking to a realtor about options for your new residence and how to begin the process. You’ll find some of the devices are worth the investment.